The Ferrari 375 MM was a very exclusive car built by Ferrari between 1953 and 1955. It was a big-engined car – but Enzo wanted an even bigger engine – a faster race car that he could sell to his customers. So he commissioned a run of racing barchettas that used a bored and stroked Formula 1 V-12 engine. The 4,954 cc V-12 was initially underrated at 330 horsepower (later it would be listed as 347 with a top speed of 186 mph). The car was more or less abandoned in Cincinnati after its racing career ended. In 1989, someone removed it from the land it sat on and it was sold to a French buyer. The guy in Cincy reported it stolen and Belgian authorities impounded the car. A lawsuit ensued but the car was gloriously restored and the suit eventually settled. More litigation followed by heirs over car parts – but thankfully everything has been settled and this car is ready to race in the hands of its new owner. This was the best Ferrari the company produced up to 1954. The fastest, most dominant prancing horse there was. It is one of five built and could bring a record amount for a Ferrari of this vintage at auction. Click here for more info and here for more from Bonhams’ Goodwood sale. 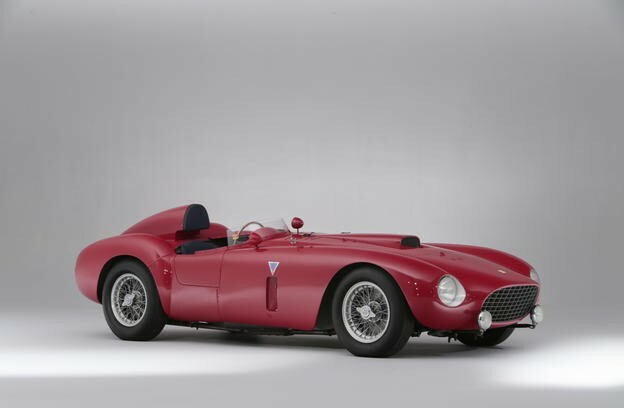 This entry was posted in Uncategorized and tagged 1954, 375 plus, auctions, Bonhams, cars, classic cars, ferrari, pinin farina, race cars, spider competizione by classiccarweekly. Bookmark the permalink.